In 2015, American homeowners insurance companies paid over $530 million to settle dog bite claims. That figure has increased almost every year since 2013, and the $530 million level is 15 percent higher than it was in 2014. Observers say the nature of these attacks is mostly responsible for the near-perennial increases. In addition to bites and scratches, most animal attacks also involve knockdowns, and the additional blunt force trauma significantly worsens the trauma injuries. Moreover, many animal attack victims suffer PTSD-like symptoms after the incident. These symptoms are particularly common among children, and sadly, children under 10 are one of the most at-risk age groups for serious dog bite injuries. Altogether, dogs bite about 3 million people a year, and most of these victims are treated in hospital emergency rooms. Florida is a strict liability jurisdiction, so dog owners are liable for damages as a matter of law if their animals attack and there is no legal defense. In contrast, many other states use some form of the so-called one bite rule, which requires victim/plaintiffs to prove that the dog had either attacked someone before or that the owner knew the animal was dangerous. Similarly, Florida does not limit the damages available to dog bite victims. These damages include compensation for tangible losses, such as medical bills, and intangible losses, such as pain and suffering. Depending on the facts of the case, such as the extent of the victim’s injuries, significant punitive damages may be available as well. In strict liability cases, victim/plaintiffs normally only need to prove factual and legal causation to obtain damages. Because of the eggshell skull rule, which basically says that all victims are treated alike regardless of any preexisting condition or susceptibility to injury, legal causation is the prong that most insurance company lawyers challenge, and these challenges are discussed below. Negligence: Nonowners are negligent, and therefore liable for damages, if their conduct falls below the standard of care. For example, school officials are probably negligent if they allow children to play with a stray dog. Scienter: “Knowledge” is another form of nonowner liability that often applies to dog sitters. If the person knew that the dog was dangerous, the person may be liable for damages. Negligence Per Se: Most municipalities have leash laws that require dogs to be behind fences in private and on leashes when in public, and anyone who violates such a safety statute is probably liable for damages as a matter of law. Punitive damages are usually not very likely in simple negligence cases and somewhat more likely in the other two categories, particularly negligence per se (negligence “as such”). Contributory negligence, in one form or another, is one of the most common defenses. Typically, insurance company lawyers argue that the victim provoked the animal. In this context, words alone are not sufficient provocation; instead, the victim must commit an act that causes the animal so much pain, or engenders so much fear, that an attack was an inevitable response. Under Florida law, children under 6 cannot provoke animals. Florida is a pure comparative fault state, meaning that the judge divides damages based on fault alone and not on any percentage threshold. Assumption of the risk is another recognized defense in the Sunshine State. 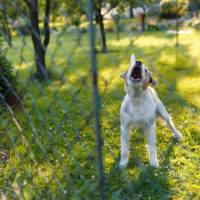 If the owner posted a “Beware of Dog” sign in plain view, the attack occurred on the owner’s property, and the victim was capable of reading and understanding the sign, the owner may not be liable for damages. Dog bite victims are usually entitled to significant compensation. For a free consultation with an experienced personal injury lawyer in Brandon, contact Reed & Reed. We do not charge upfront legal fees in negligence cases.